Organic nomenclature questions can start off so innocently, then before one knows it, one has wasted more time than a 16 year old on Instagram, Twitter, Facebook and Snapchat combined. It all started off so simply. Originally, someone other than me, asked if a phenyl group attached to an eight carbon aliphatic chain should be called 4-phenyloctane or 4-octanylbenzene. I believe that the IUPAC answer is 4-octanylbenzene, but in most cases many (including me) take the view that the non-ambiguous 4-phenyloctane would be entirely OK, too. Anyway, thinking about that question led me down a rabbit-hole. 4-octanylbenzene is (apparently) consistent with Blue Book Rule A-12.2. However, things get more confusing when one looks at Rule A-61.4 (that A-12.2 references). The first example given in A-61.4 (1-phenylhexadecane) is supposed to elucidate the idea that when the aliphatic chain is LONGER than the cyclo part of the compound (in this case benzene), that the compound should be named by considering the ring as a substituent that is added to the longer, aliphatic chain. I get that, BUT isn’t that in contradiction to our first example and Rule A-12.2? When we consider the name 4-octanylbenzene, shouldn’t “1-phenylhexadecane” actually be called 1-hexadecylbenzene? Indeed, ChemSpider appears to contradict the Blue Book, in that it calls that compound hexadecylbenzene, which seems to be consistent with A-12.2! Organic nomenclature can be a nasty rabbit-hole waiting to swallow you up, and this looks like just another such occasion – unless someone can explain this to me. It does not list 4-octanylbenzene specifically but octan-4-ylbenzene is close. I don’t “like” either of the names with “octanyl” since 1) the hydrocarbon chain attached to the benzene is branched and 2) I think the usual IUPAC name for an 8-carbon “alkyl” substitutent group is octyl rather than octanyl. Using octan-4-ol as a rationale for calling the branched substitutent attached to the benzene ring 4-octanyl does not seem a proper comparison. All of the examples in rule 12 are either unbranched substitutent son the benzene or accepted common name-branched groups such as isopropyl or text-butyl. I propose that rule 61 take precedence, in that the hydrocarbon chain has more carbons, and that is the “point” of the rule. 4-phenyloctane has the virtue of simplicity and being consistent with the above rule. 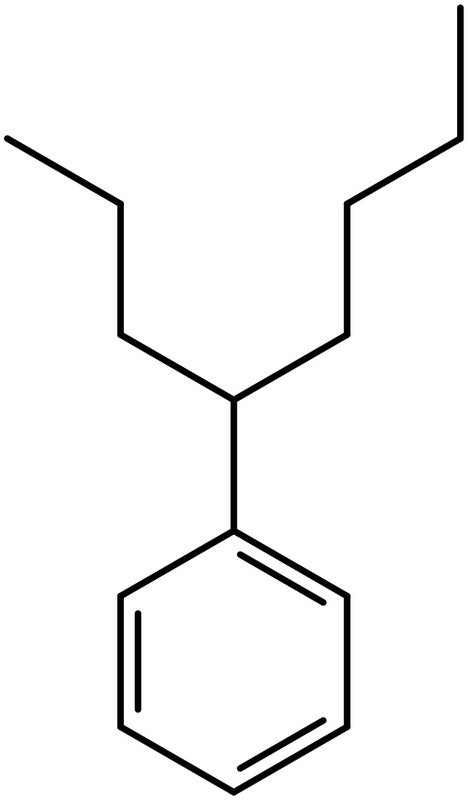 Alternatively, as a substituted benzene it might more appropriately be something like 1-(1-propyl)pentylbenzene.